Females reach sexual maturity between one-and-a-half and three years of age. They typically average one litter every two to three years throughout their reproductive life; the period can be as short as one year. Females are in estrus for approximately 8 days of a 23-day cycle; the gestation period is approximately 91 days. Females are sometimes reported as monogamous, but this is uncertain and polygyny may be more common. Copulation is brief but frequent. Only females are involved in parenting. Female cougars are fiercely protective of their kittens, and have been seen to successfully fight off animals as large as grizzly bears in their defense. Litter size is between one and six kittens, typically two or three. Caves and other alcoves that offer protection are used as litter dens. Born blind, kittens are completely dependent on their mother at first, and begin to be weaned at around three months of age. As they grow, they begin to go out on forays with their mother, first visiting kill sites, and after six months beginning to hunt small prey on their own. Kitten survival rates are just over one per litter. Sub-adults leave their mother to attempt to establish their own territory at around two years of age and sometimes earlier; males tend to leave sooner. One study has shown high morbidity amongst cougars that travel farthest from the maternal range, often due to conflicts with other cougars ("intraspecific" conflict). Research in New Mexico has shown that "males dispersed significantly farther than females, were more likely to traverse large expanses of non-cougar habitat, and were probably most responsible for nuclear gene flow between habitat patches." Life expectancy in the wild is reported at between 8 to 13 years, and probably averages 8 to 10; a female of at least 18 years was reported killed by hunters on Vancouver Island. Cougars may live as long as 20 years in captivity. Causes of death in the wild include disability and disease, competition with other cougars, starvation, accidents, and, where allowed, human hunting. Feline immunodeficiency virus, an endemic AIDS-like disease in cats, is well-adapted to the cougar. Like almost all cats, the cougar is a solitary animal. Only mothers and kittens live in groups, with adults meeting only to mate. It is secretive and crepuscular, being most active around dawn and dusk. Estimates of territory sizes vary greatly. Canadian Geographic reports large male territories of 150 to 1000 square kilometers (58 to 386 sq mi) with female ranges half the size. Other research suggests a much smaller lower limit of 25 km² (10 sq mi) but an even greater upper limit of 1300 km² (500 sq mi) for males. In the United States, very large ranges have been reported in Texas and the Black Hills of the northern Great Plains, in excess of 775 km² (300 sq mi). Male ranges may include or overlap with those of females but, at least where studied, not with those of other males, which serves to reduce conflict between cougars. Ranges of females may overlap slightly with each other. Scrape marks, urine, and feces are used to mark territory and attract mates. Males may scrape together a small pile of leaves and grasses and then urinate on it as a way of marking territory.Home range sizes and overall cougar abundance depend on terrain, vegetation, and prey abundance. One female adjacent to the San Andres Mountains, for instance, was found with a large range of 215 km² (83 sq mi), necessitated by poor prey abundance. Research has shown cougar abundances from 0.5 animals to as much as 7 (in one study in South America) per 100 km² (38 sq mi). Because males disperse further than females and compete more directly for mates and territory, they are most likely to be involved in conflict. Where a sub-adult fails to leave his maternal range, for example, he may be killed by his father. When males encounter each other, they hiss and spit, and may engage in violent conflict if neither backs down. 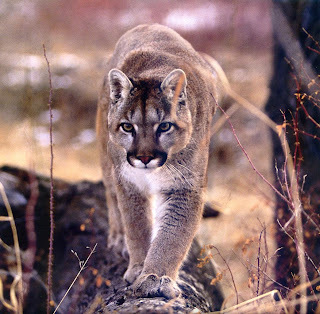 Hunting or relocation of the cougar may increase aggressive encounters by disrupting territories and bringing young, transient animals into conflict with established individuals. The cougar has the largest range of any wild land animal in the Americas. Its range spans 110 degrees of latitude, from northern Yukon in Canada to the southern Andes. It is one of only three cat species, along with the bobcat and Canadian lynx, native to Canada. Its wide distribution stems from its adaptability to virtually every habitat type: it is found in all forest types as well as in lowland and mountainous deserts. Studies show that the Cougar prefers regions with dense underbrush, but can live with little vegetation in open areas. Its preferred habitats include precipitous canyons, escarpments, rim rocks, and dense brush. The cougar was extirpated across much of its eastern North American range with the exception of Florida in the two centuries after European colonization and faced grave threats in the remainder. Currently, it ranges across most western American states, the Canadian provinces of Alberta and British Columbia, and the Canadian Yukon Territory. There have been widely debated reports of possible recolonization of eastern North America. DNA evidence has suggested its presence in eastern North America, while a consolidated map of cougar sightings shows numerous reports, from the mid-western Great Plains through to Eastern Canada. The only unequivocally known eastern population is the Florida panther, which is critically endangered. There have also been sightings in Elliotsville, Maine in the central part of the state. On April 14, 2008 police shot and killed a cougar on the north side of Chicago, Illinois. DNA tests were consistant with cougars from the Black Hills. South of the Rio Grande, the International Union for the Conservation of Nature and Natural Resources (IUCN) lists the cat in every Central and South American country except Costa Rica and Panama. While specific state and provincial statistics are often available in North America, much less is known about the cat in its southern range. The cougar's total breeding population is estimated at less than 50,000 by the IUCN, with a declining trend. U.S. state-level statistics are often more optimistic, suggesting cougar populations have rebounded. In Oregon, a healthy population of 5,000 was reported in 2006, exceeding a target of 3,000. California has actively sought to protect the cat and a similar number of cougars has been suggested, between 4,000 and 6,000. Aside from humans, no species preys upon mature Cougars in the wild. The cat is not, however, the apex predator throughout much of its range. In its northern range, the Cougar interacts with other powerful predators such as the Brown Bear and Gray Wolf. In the south, the Cougar must compete with the larger Jaguar. In Florida it encounters the American Alligator. The Yellowstone National Park ecosystem provides a fruitful microcosm to study inter-predator interaction in North America. Of the three large predators, the massive brown bear appears dominant, often although not always able to drive both the gray wolf pack and the cougar off their kills. One study found that Brown or American Black Bears visited 24% of cougar kills in Yellowstone and Glacier National Parks, usurping 10% of carcasses. The gray wolf and the cougar compete more directly for prey, especially in winter. While individually more powerful than the gray wolf, a solitary cougar may be dominated by the pack structure of the canines. Wolves can steal kills and occasionally kill the cat. One report describes a large pack of fourteen wolves killing a female cougar and her kittens. Conversely, lone wolves are at a disadvantage, and have been reported killed by cougars. Wolves more broadly affect cougar population dynamics and distribution by dominating territory and prey opportunities, and disrupting the feline's behavior. Preliminary research in Yellowstone, for instance, has shown displacement of the cougar by wolves.One researcher in Oregon notes: "When there is a pack around, cougars are not comfortable around their kills or raising kittens … A lot of times a big cougar will kill a wolf, but the pack phenomenon changes the table." Both species, meanwhile, are capable of killing mid-sized predators such as bobcats and coyotes and tend to suppress their numbers. In the southern portion of its range, the cougar and jaguar share overlapping territory. The jaguar tends to take larger prey and the cougar smaller where they overlap, reducing the cougar's size. Of the two felines, the cougar appears best able to exploit a broader prey niche and smaller prey. As with any predator at or near the top of its food chain, the cougar impacts the population of prey species. Predation by cougars has been linked to changes in the species mix of deer in a region. For example, a study in British Columbia observed that the population of mule deer, a favored cougar prey, was declining while the population of the less frequently preyed-upon white-tailed deer was increasing. The Vancouver Island Marmot, an endangered species endemic to one region of dense cougar population, has seen decreased numbers due to cougar and gray wolf predation. The World Conservation Union (IUCN) currently lists the cougar as a "near threatened" species. It has shifted the cougar's status from "least concern," while leaving open the possibility that it may be raised to "vulnerable" when greater data on the cat's distribution becomes available. The cougar is regulated under Appendix I of the Convention on International Trade in Endangered Species of Wild Fauna and Flora (CITES), rendering illegal international trade in specimens or parts. East of the Mississippi, the only unequivocally known cougar population is the Florida panther. 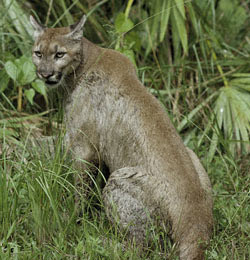 The United States Fish and Wildlife Service recognizes both an Eastern cougar and the Florida panther, affording protection under the Endangered Species Act. 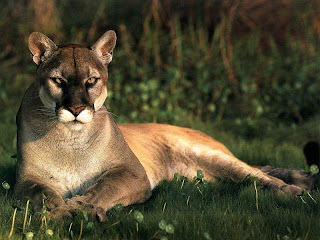 Certain taxonomic authorities have collapsed both designations into the North American Cougar, with Eastern or Florida subspecies not recognized, while a subspecies designation remains recognized by some conservation scientists. The most recent documented count for the Florida sub-population is 87 individuals, reported by recovery agencies in 2003. The cougar is also protected across much of the rest of their range. 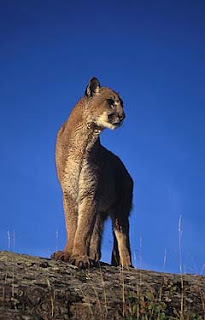 As of 1996, cougar hunting was prohibited in Argentina, Brazil, Bolivia, Chile, Colombia, Costa Rica, French Guiana, Guatemala, Honduras, Nicaragua, Panama, Paraguay, Suriname, Venezuela, and Uruguay. (Costa Rica and Panama are not listed as current range countries by the IUCN.) The cat had no reported legal protection in Ecuador, El Salvador, and Guyana. Regulated cougar hunting is still common in the United States and Canada, although they are protected from all hunting in the Yukon. ; it is permitted in every U.S. state from the Rocky Mountains to the Pacific Ocean, with the exception of California. Cougars are generally hunted with packs of dogs, until the animal is 'treed'. When the hunter arrives on the scene, he shoots the cat from the tree at close range. 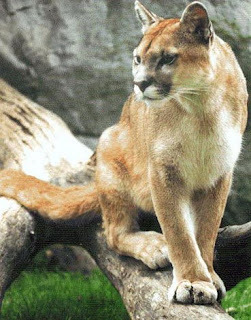 The Cougar cannot be legally killed in California except under very specific circumstances, such as when an individual is declared a public safety threat. However statistics from the Department of Fish and Game indicate that cougar killings in California have been on the rise since 1970s with an average of over 112 cats killed per year from 2000 to 2006 compared to 6 per year in the 1970s. Conservation threats to the species include persecution as a pest animal, degradation and fragmentation of their habitat, and depletion of their prey base. Wildlife corridor and sufficient range areas are critical to the sustainability of cougar populations. Research simulations have shown that the animal faces a low extinction risk in areas of 2200 km² (850 sq mi) or more. As few as one to four new animals entering a population per decade markedly increases persistence, foregrounding the importance of habitat corridors. The grace and power of the cougar have been widely admired in the cultures of the indigenous peoples of the Americas. The Inca city of Cusco is reported to have been designed in the shape of a cougar, and the animal also gave their name to both Inca regions and people. The Moche people represented the puma often in their ceramics. The sky and thunder god of the Inca, Viracocha, has been associated with the animal. In North America, mythological descriptions of the cougar have appeared in the stories of the Hotcâk language ("Ho-Chunk" or "Winnebago") of Wisconsin and Illinois and the Cheyenne, amongst others. To the Apache and Walapai of Arizona, the wail of the Cougar was harbinger of death. The cougar continues to be a symbol of strength and stealth. From combat helicopters, motor vehicles (see Ford/Mercury Cougar and Ford Puma) to athletic shoes, both "Cougar" and "Puma" are widely used as brand names. Various sports teams have also adopted the names, including the Argentina national rugby union team, the National Autonomous University of Mexico soccer club as well as US universities, Brigham Young University, The University of Houston, Washington State University, and The University of Vermont. Many places, such as Cougar Mountain, are also named after their association with cougars.